Many students at Winter Springs are celebrating their Hispanic heritage this month. Hispanic Heritage Month is here! Students with Hispanic heritage are excited to show who they are and celebrate where they have come from. Hispanic Heritage Month, which lasts from September 15 to October 15, is a month that celebrates Hispanic-Americans. It honors all that Hispanics have done to help our country become what it is today. And it also lets us see what their beautiful culture is like! Hispanics have had a very positive impact on our country and have brought many wonderful traditions here. Hispanic Heritage Month was first started in 1968 and it celebrates the independence of Costa Rica, El Salvador, Guatemala, Nicaragua, and Honduras. Also during this month, Chile, Mexico, and Belize celebrate their independence. 17% of America, or 55 million people, are either Hispanic or Latino. During this month people get the opportunity to learn more about Hispanic heritage and Hispanic people who have played a vital role in our American history. Florida will be holding Hispanic Heritage events this month. There is an art contest for grades k-3 and an essay contest for grades 4-5, 6-8, and 9-12. Two Winners of the art contest will receive a prize at Governor Rick Scott and his wife First Lady Anne Scott’s Hispanic Heritage Month celebration. One elementary student, one middle school student, and one high school student will win a four year Florida College plan scholarship and will get an award at Governor Rick Scott and his wife First Lady Ann Scott’s Hispanic Heritage Month celebration. Students here at Winter Springs High School are participating in this to have the chance to win. All entries have to be turned in by 5:00 on Tuesday September 12. If students win they will be notified on September 19. There have been many Hispanic historical figures throughout American history such as Ellen Ochoa who was the first Hispanic woman to go up into space. She is an inspiration to all women around the world. Other inspirational figures include Pat Mora who was a Latina author. She has written many poems and children’s nonfiction books. Children all over the U.S. enjoy reading her books. Hispanic-Americans have made such a positive impact on our country and have incorporated much of their beautiful culture into our lives. Hispanic Heritage month helps us to celebrate that. 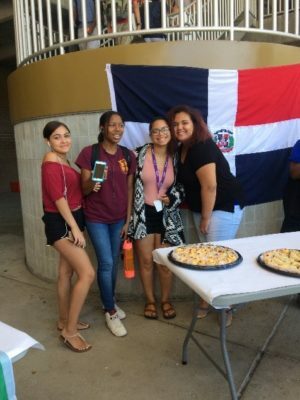 On Wednesday September 28th, Winter Springs High School held a celebration out in the courtyard by building six during lunch. There was food and Hispanic music playing. There was also the flags of Hispanic and Latino countries hung up and poster boards presenting information about each country. It was an amazing way for Hispanic students to celebrate and non-Hispanic students to learn more about this amazing culture.